The Laser Raman (785-series) is a line of continuous-wave lasers designed specifically for Raman spectroscopy. These high-power excitation sources have integrated laser drivers and a thermoelectric coolers. The Raman lasers have narrow spectral lines, is compact and features hermetically sealed laser component make it optimal for industrial and medical applications. We offer optional high power lasers for Raman excitation wavelengths of 532, 638 and 1064 nm. 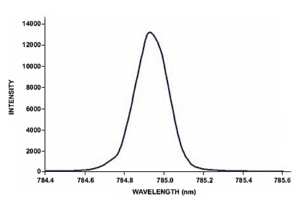 Laser-785 Spectral Output : the Laser-785 has a narrow spectral line width of only 0.2 nm. We used the HR4000 High-resolution Spectrometer to capture the output of the Laser-785 as shown in the spectrum (see picture).